Cannonball riders prove their road smarts by parking as close as possible to what are affectionately known as the “cleanest rest rooms in Vermont.” Photos by Kurt Ernst. 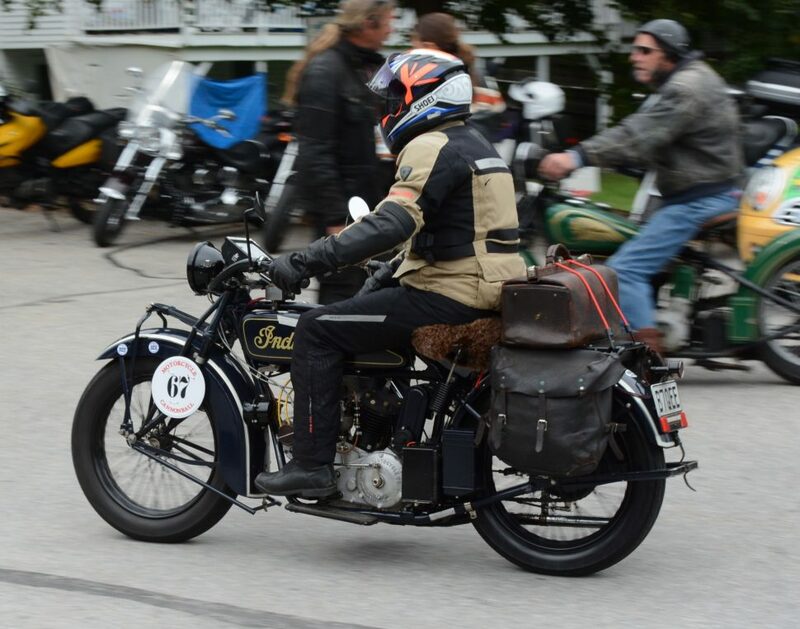 Since 2010, the biennial Motorcycle Cannonball has taken riders of vintage motorcycles — built prior to 1929 — on a coast-to-coast backroad odyssey, described as “the most difficult antique endurance run in the world.” This year’s journey — the fifth Motorcycle Cannonball — takes participants from Portland, Maine, to Portland, Oregon, and on Sunday, September 9, riders enjoyed an all-too-brief stop at Hemmings headquarters in Bennington, Vermont. James Maloney aboard his 1928 Indian Scout. The sheepskin seat cover will come in handy over the course of the next 15 days. Bartek Mizerski is no stranger to the Motorcycle Cannonball. 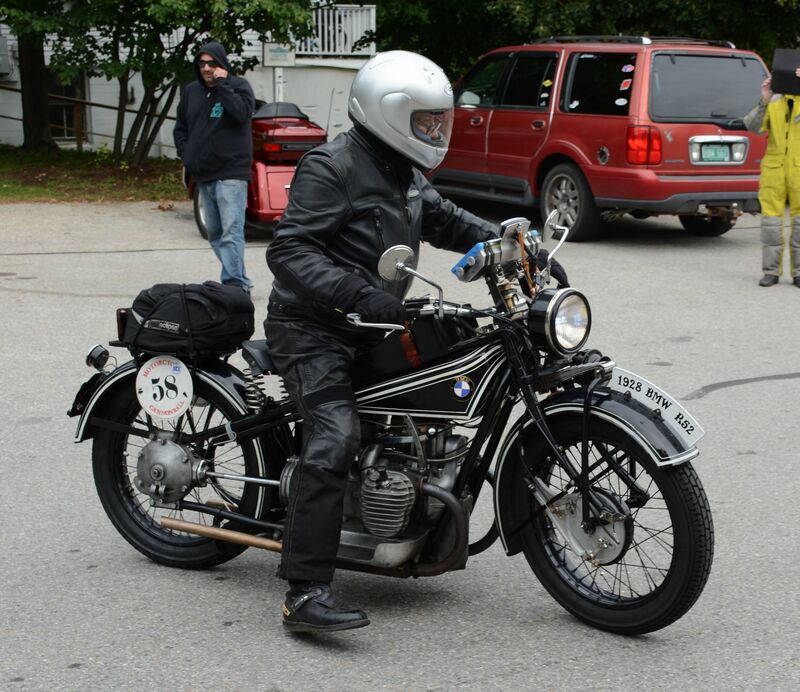 He rode a Polish 1936 Sokol 1000 in the 2014 Cannonball and completed every mile. 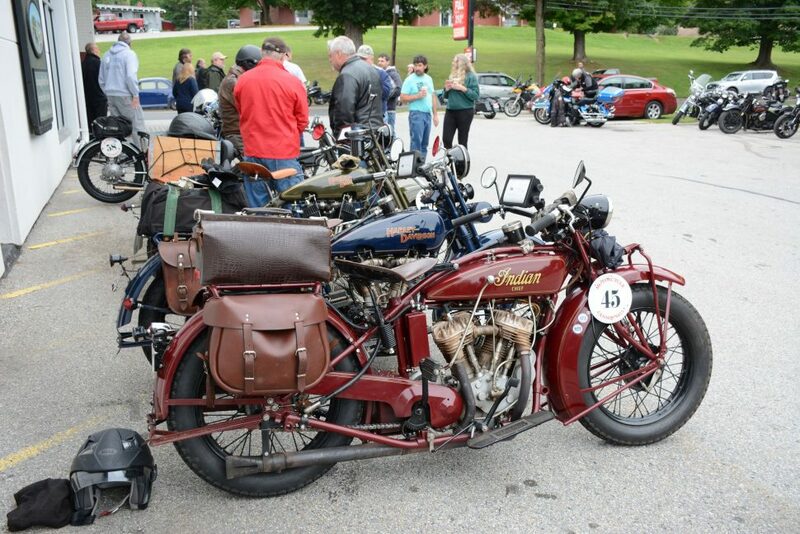 This year he brought his 1928 Indian Scout 101. Aussie Peter Arundel made the long trip to the race with buddy Dave Reidie. 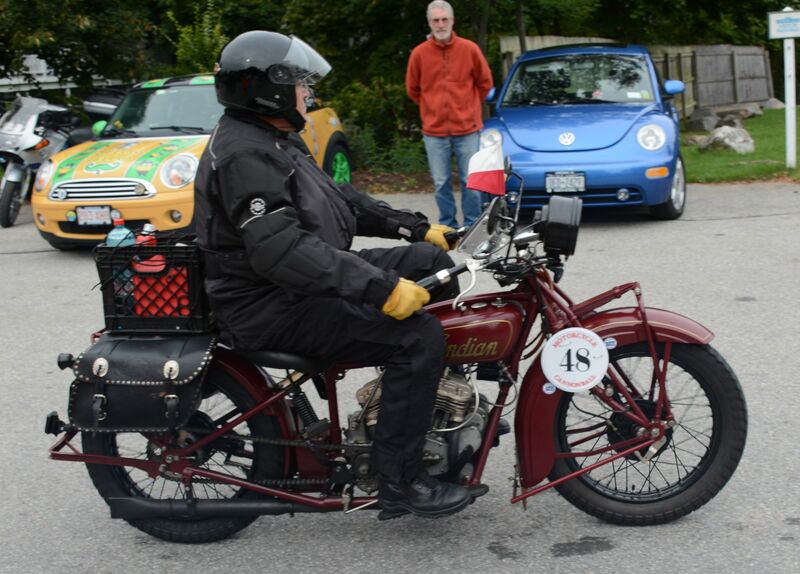 Both are aboard 1928 bikes, Peter on his Indian and Dave on his Harley-Davidson. 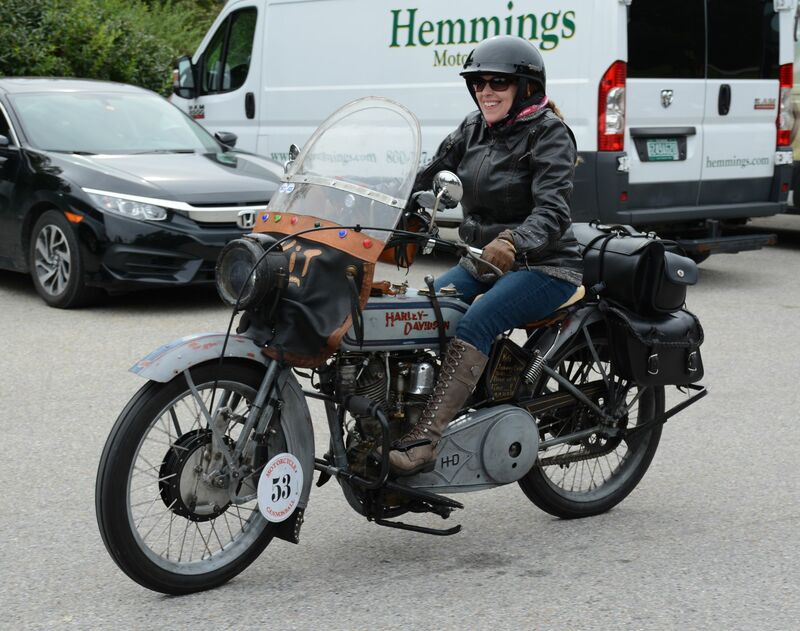 The 2018 Motorcycle Cannonball began on September 8, with an initial overnight stop in Keene, New Hampshire. 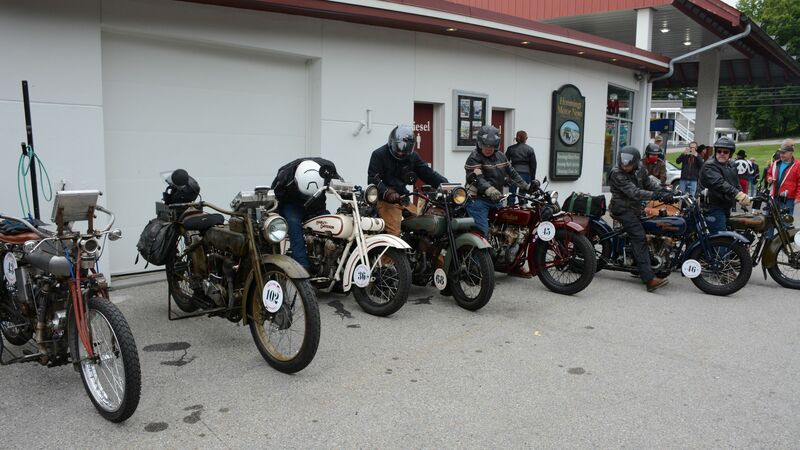 After the checkpoint at Hemmings, riders continued to the next overnight stop — via other waypoints — in Binghamton, New York. Other stops along this year’s journey include Jamestown, New York; Bowling Green, Ohio; Bourbonnais, Illinois; Anamosa, Iowa; Spirit Lake, Iowa; Pierre, South Dakota; Sturgis, South Dakota; Billings, Montana; Great Falls, Montana; Kalispell, Montana; Spokane Valley, Washington; The Dales, Oregon; and finally, to the Grand Finale on September 23 in Portland, Oregon. 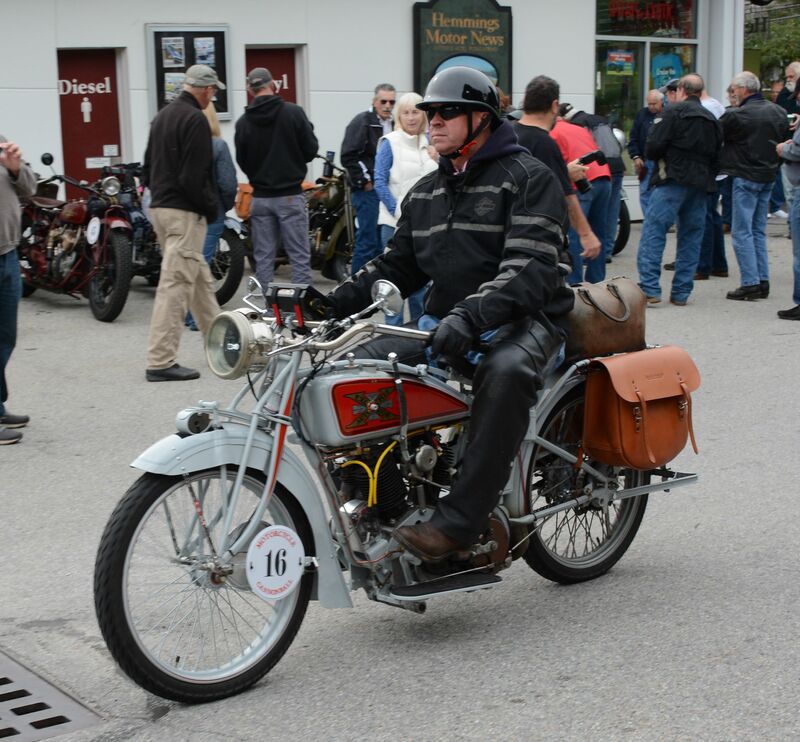 Norm Nelson’s 1928 BMW Model R52 is one of the few shaft-drive bikes in the event. The two-cylinder Boxer engine sustained BMW production for decades. 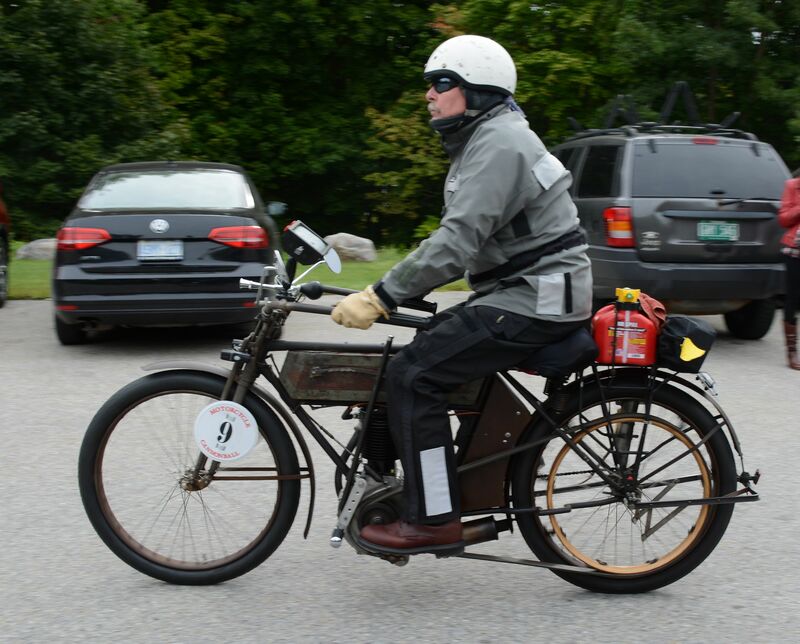 Author and museum curator Charles Falco’s 1928 Model C is the only Ariel entered in this year’s event. 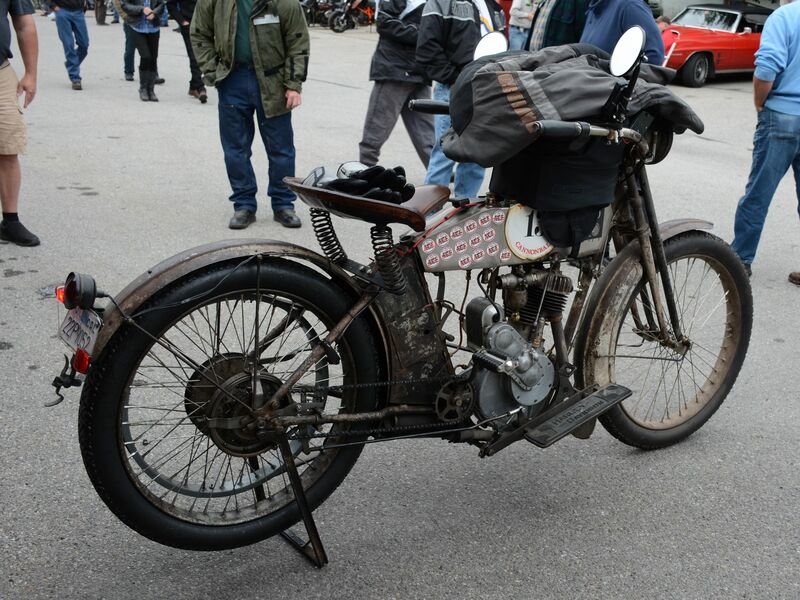 Charles Falco’s 1928 Ariel Model C features a 498-cc single-cylinder that produces a whopping 5 hp and features a three-speed transmission with a Sturmey-Archer hand change gearbox. 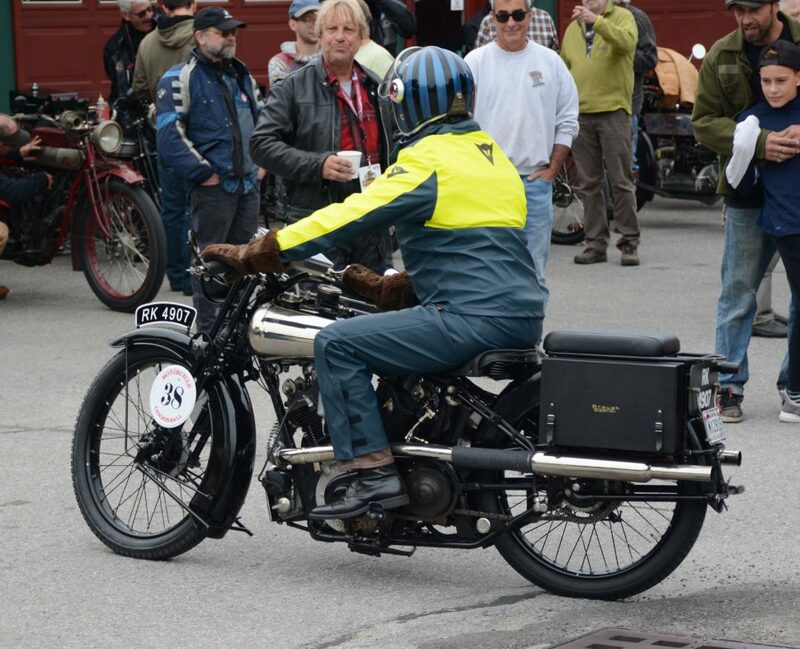 New Zealander Jon Turney is in his first Motorcycle Cannonball astride his 1927 Indian Scout. Including checkpoints, that’s roughly 3,750 miles, with less than 10 taking place on interstate superslabs. Riders will cover an average of 250 miles per day, dealing with heat and cold, rain and snow, and the inevitable breakdowns that are bound to occur with bikes of this vintage, ridden in such an enthusiastic manner. The event provides support for such occurrences, and most riders rejoin the Cannonball once repairs are completed. 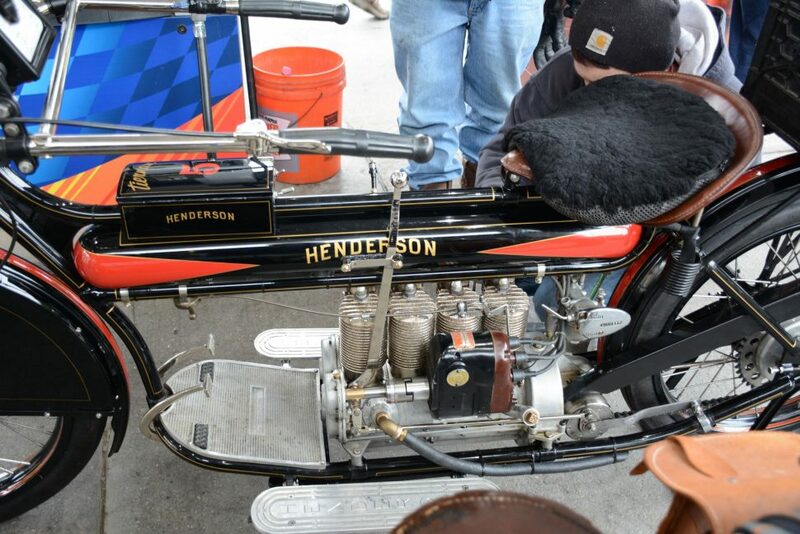 Landon Bateman pauses before gearing up again and tossing his leg over this 1927 Henderson 4. 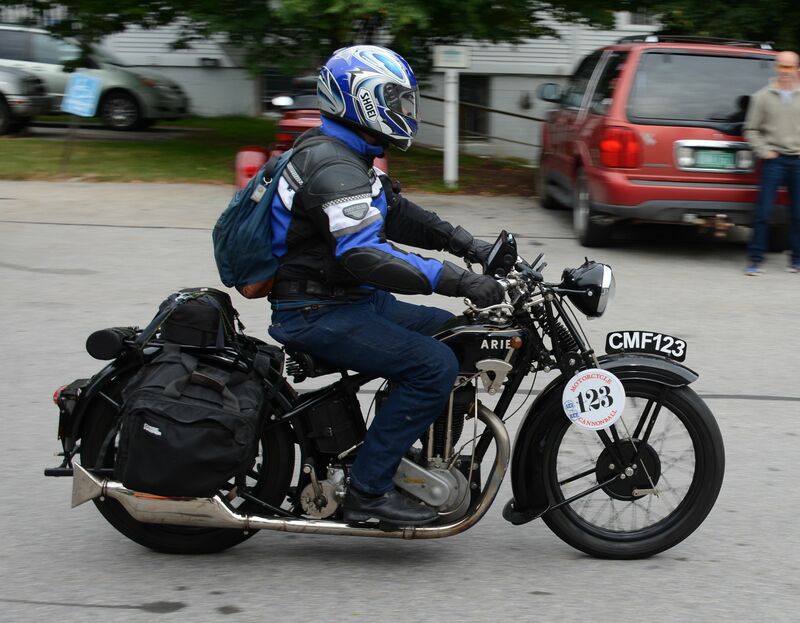 Author, photographer, and motorcycle icon Paul D’Orleans of The Vintagent.com is riding in style on this rare 1938 Brough Superior, one of only two Broughs entered this year. 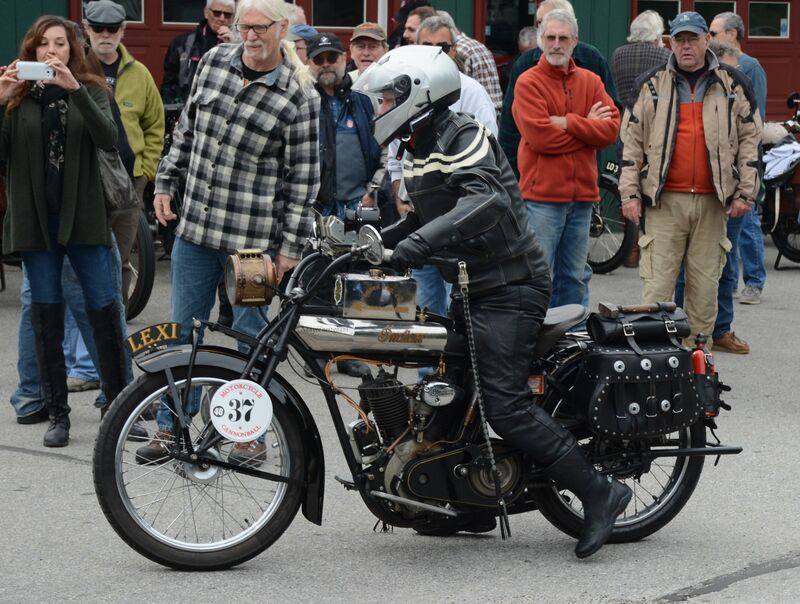 Adrian Lockrey brought his 494-cc single-cylinder 1925 Triumph Model P over from Middleton, U.K., just for this race. Brent Mayfield of Centerville, Ohio, aboard his 74-cu.in. 1925 Harley JD. 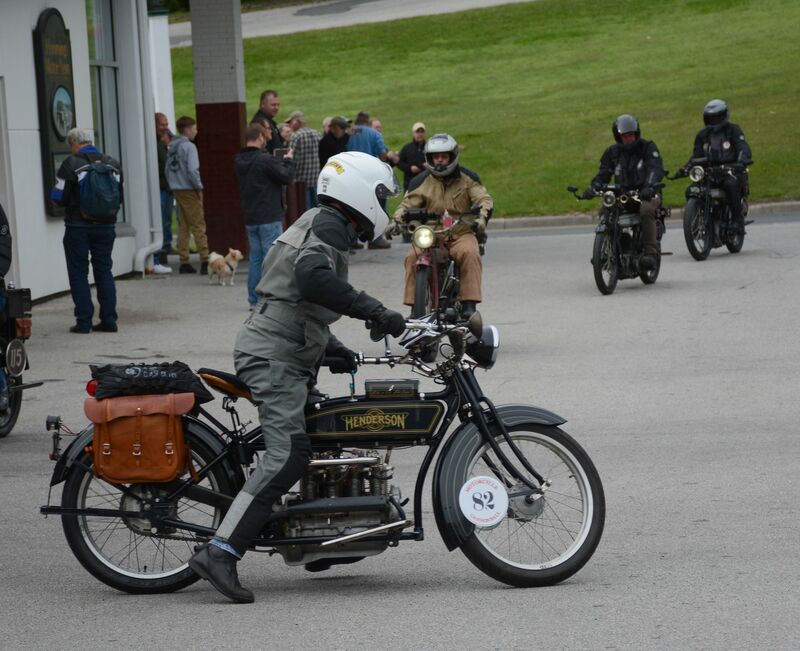 Like other vintage endurance events, the Motorcycle Cannonball attracts more participants each running. The first one, in 2010, drew 45 riders but the next event, in 2012, saw 77 participants. The 2014 Cannonball drew more than 100 riders, as did the 2016 event, but this year’s entry list contains 122 riders, from as far away as Australia and New Zealand. 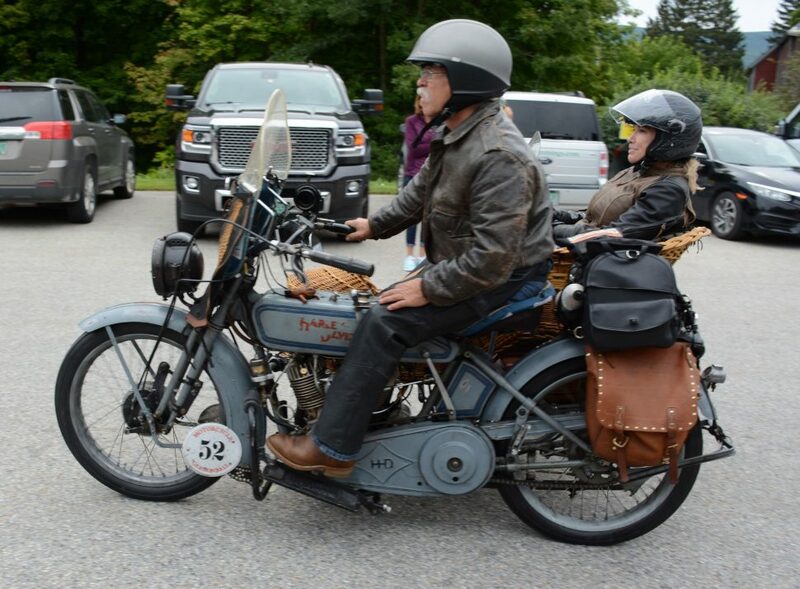 Gene Harper and wife Jan Carl are attempting their inaugural Motorcycle Cannonball side by side. 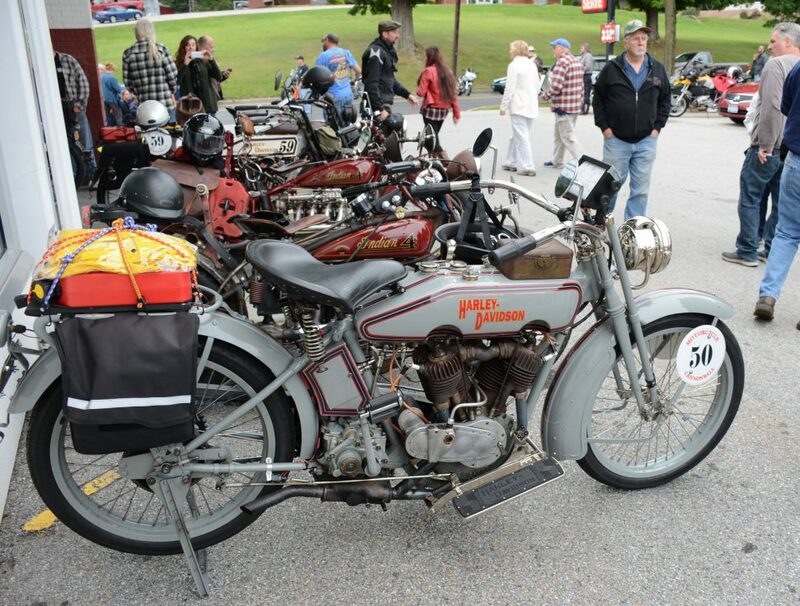 Their 1924 Indian Chief’s 61-cu.in. V-twin is more than capable of two-person transport. Chris Parry aboard his 500-cc single-cylinder 1923 Norton model 16H. 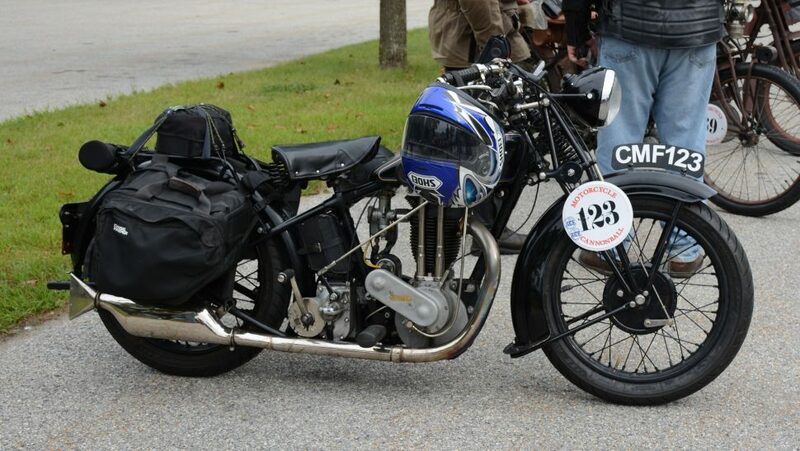 Chris also restores vintage Norton bikes, as well as British and European-built cars, in his spare time. The only Neracar entered this year, this 1923 Type A model, driven by Ben Pierce, has a single-cylinder 221-cc two-stroke 2-hp engine. 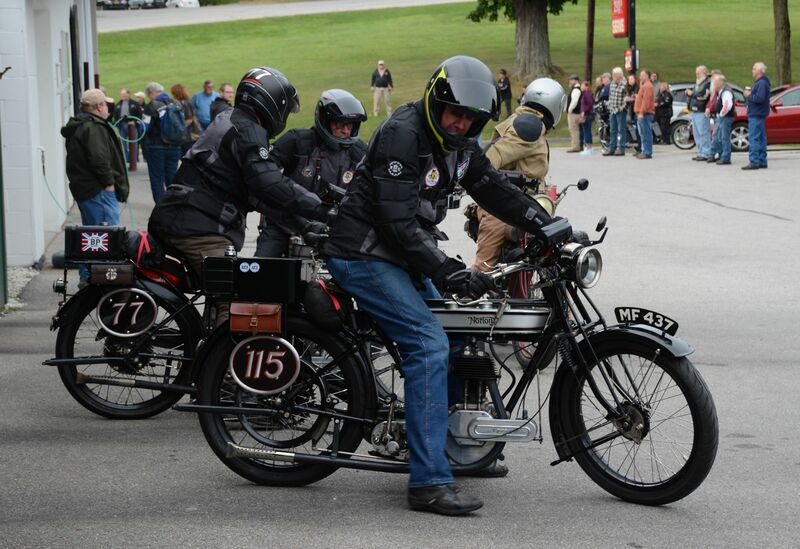 We do not know if this unit was built in Syracuse, New York, or in the U.K.
For more information on this year’s route and stops, or for additional detail on what it takes to ride a Motorcycle Cannonball yourself, visit MotorcycleCannonball.com. In the meantime, enjoy these photos from Sunday’s rest stop. Rider Dean Bordigioni has participated in all four Motorcycle Cannonballs. 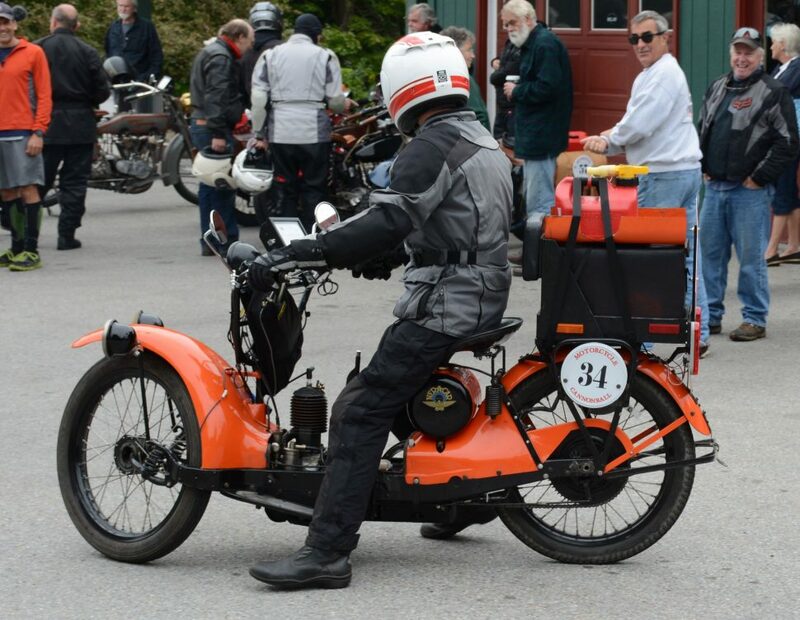 His 1923 Harley-Davidson may not look pretty but it performs like a Swiss watch. This 1915 Harley-Davidson is a little slower than rider Kersten Heling is used to. At age 16, Kersten started riding nitro-fueled H-D drag racing bikes, the youngest woman to do so. She is also one of only four women in this year’s Cannonball. 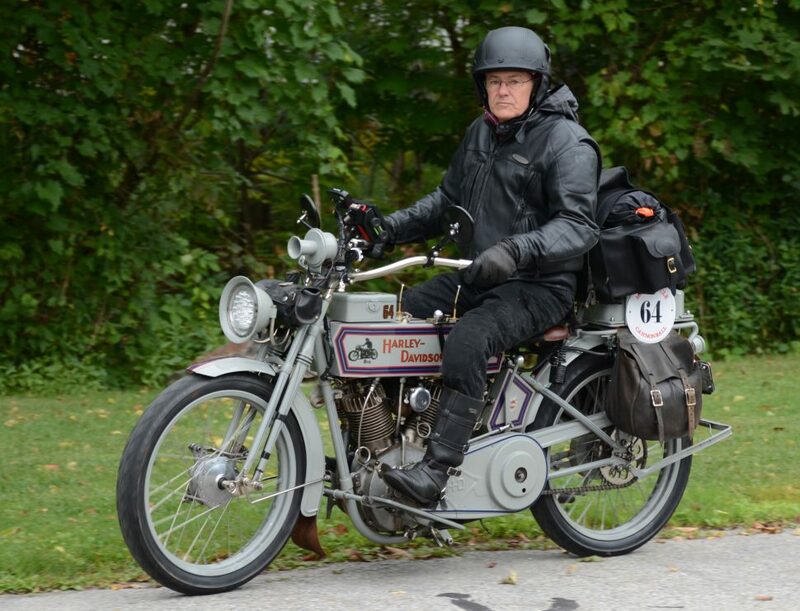 Ciao, Ciro Nisi, who is entered in his third Cannonball and traveled all the way from Italy to put himself and his 1919 Harley Model F to the ultimate test. 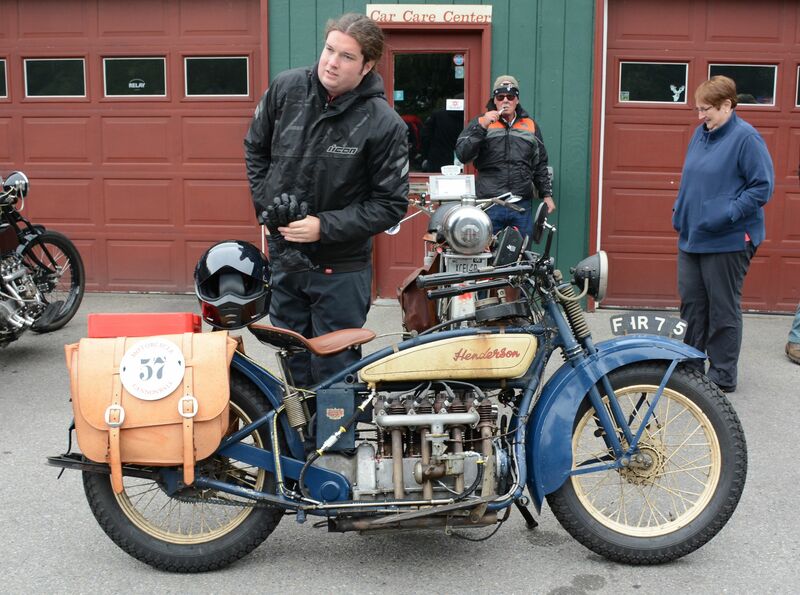 Christopher O’Brien and his 1917 Henderson hail from Vashon, Washington. Chris is related to Alan Bedell, who in 1917 broke Cannonball Baker’s cross-country speed record. 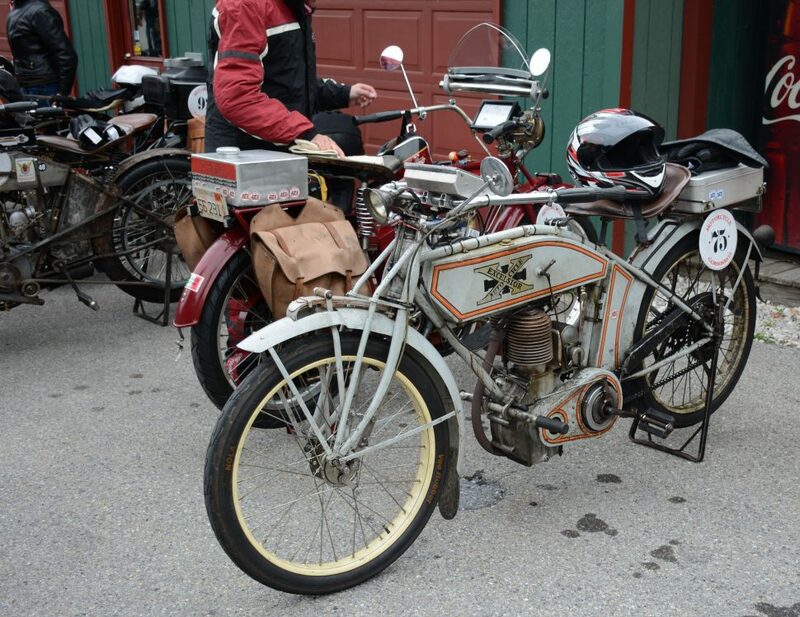 Jared Rinker’s 1916 Indian Power Plus arriving at Hemmings Motor News after a morning of Vermont mountains and twisting roads awakened his arm muscles. 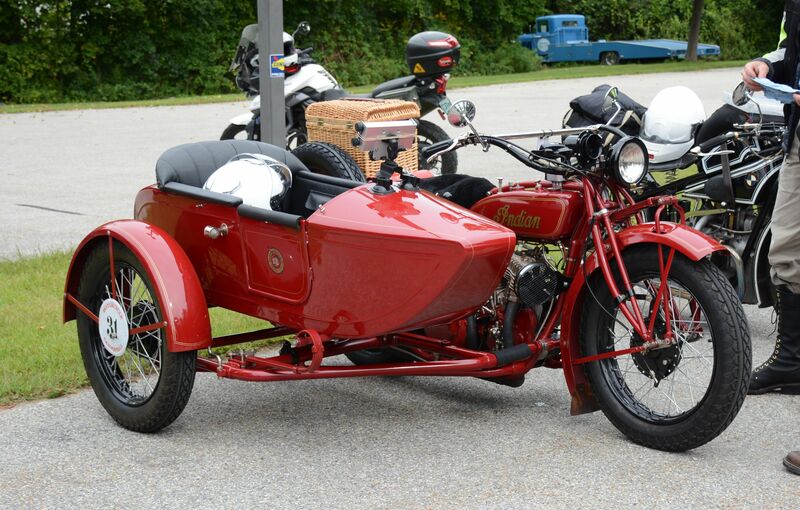 Wisconsin Harley-Davidson dealer Doc Hopkins’ 1916 Model J with wicker sidecar. Ted Walters’ 1916 Harley Model J. 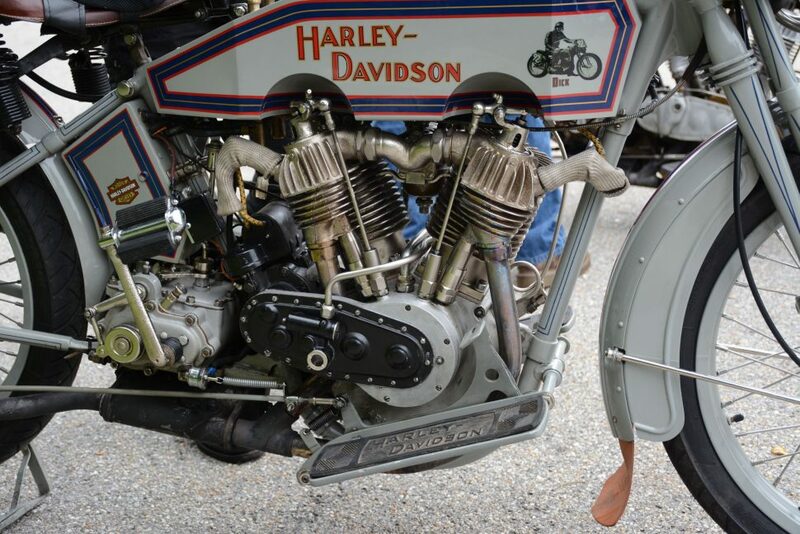 1916 was the first year Harley-Davidson eliminated the bicycle pedals. Close-up of the 1916 Excelsior 61-cu.in. IOE V-twin engine of Jeff Lauritsen, of Kennard, Nebraska. 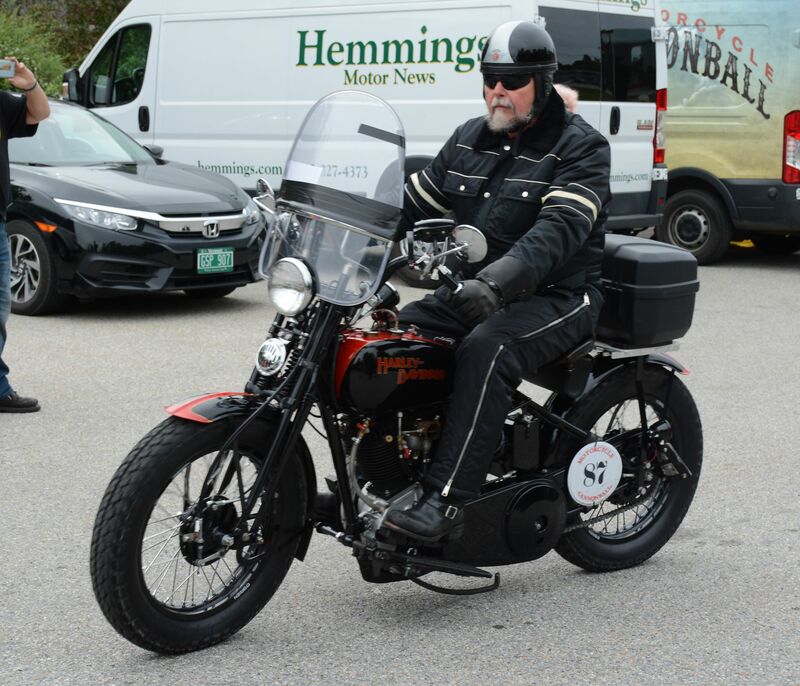 Mike Jensen first got involved with the Motorcycle Cannonball by prepping another bike for the 2016 ride. 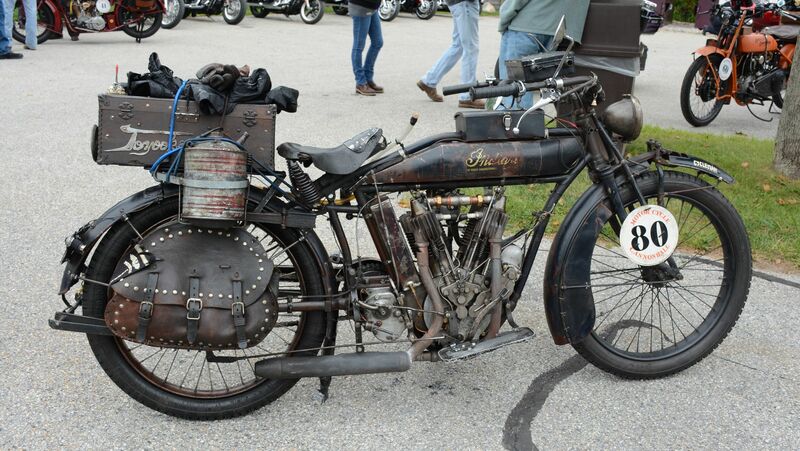 This 1916 Excelsior is bound to be a little dirtier in the next week. Shinya Kimura is a Motorcycle Cannonball veteran who has also raced at several The Race of Gentleman events in Wildwood, New Jersey, and Pismo Beach, California, aboard this same 1915 Indian. 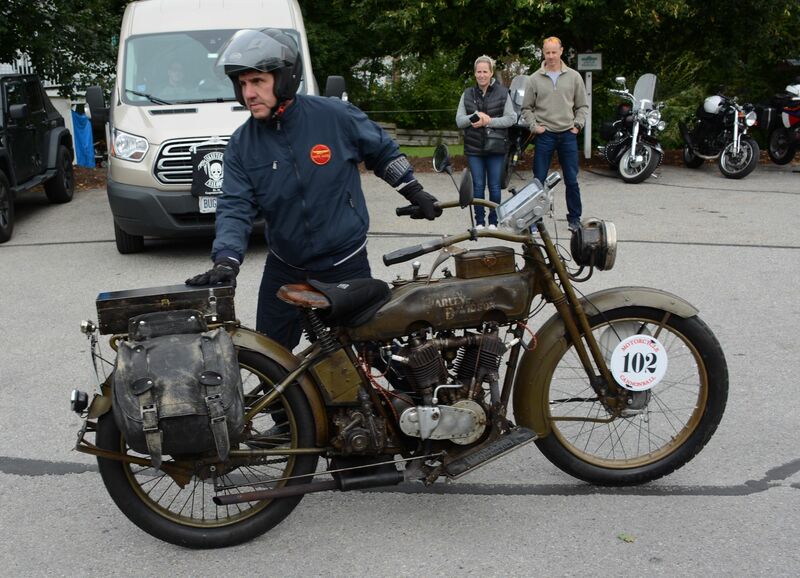 Dave Currier came all the way from Fargo, North Dakota, to participate with his 1915 Harley-Davidson 11F. Engine detail from Dave Currier’s 1915 Harley model 11F. 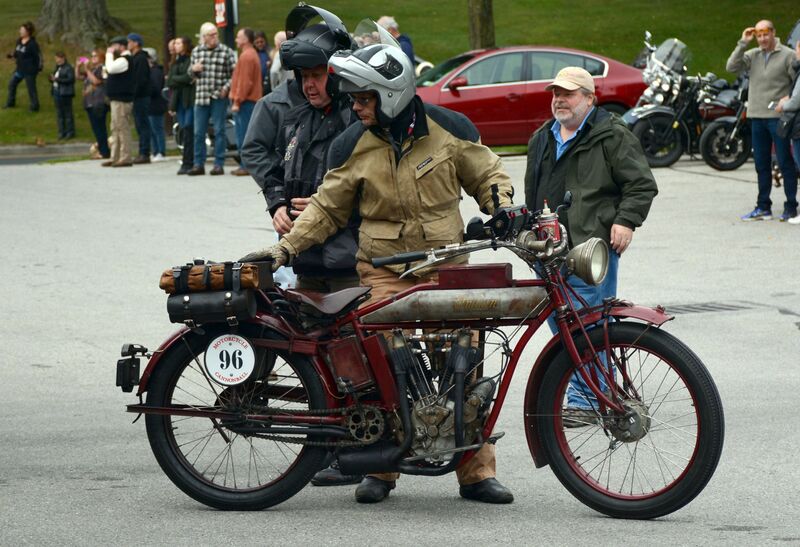 The 11-hp, OHV V-twin should serve him well for the long grind of the Cannonball. 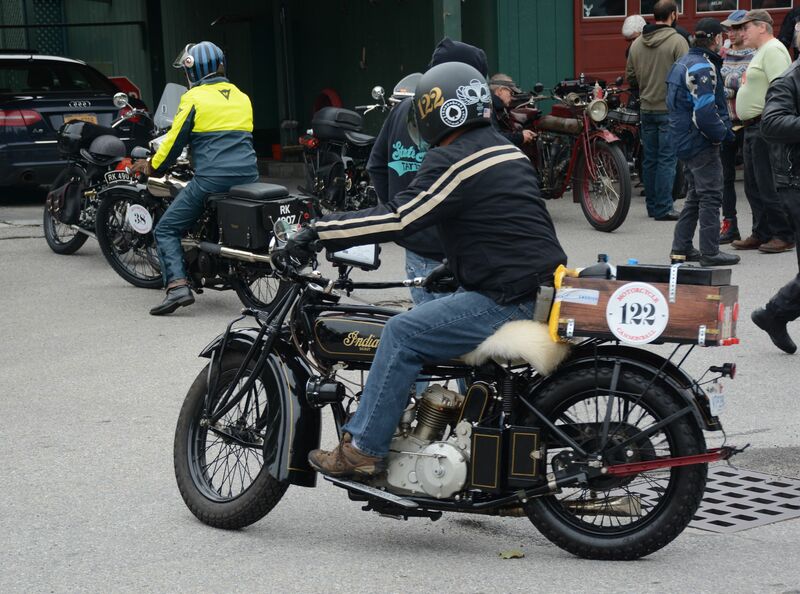 Kevin Nasser of Fort Calhoun, Nebraska, backs his 1916 Indian Hedstrom into line at the Hemmings filling station. 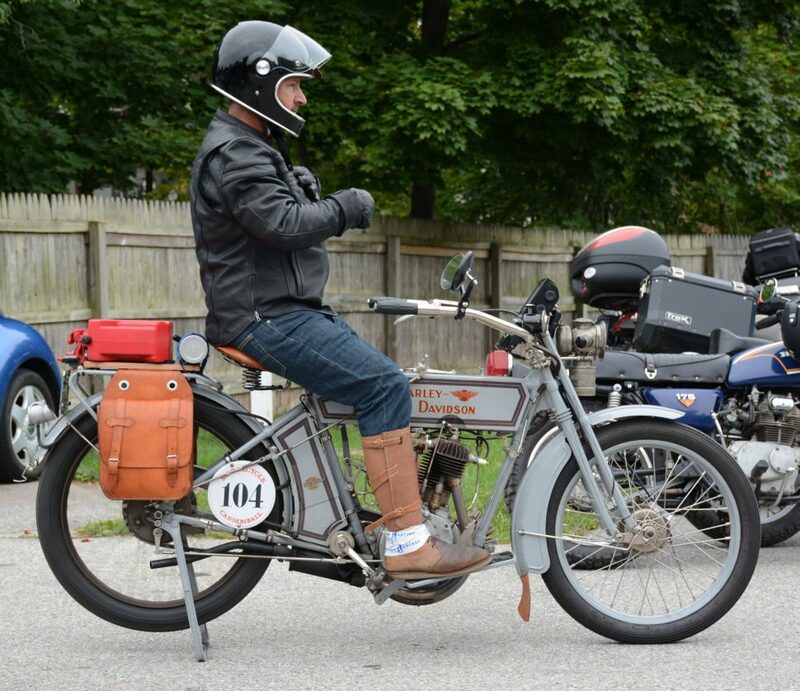 Bret Yeager straps up for the next leg of the race aboard his 1914 Harley Model 10B. Jeff Tiernan’s four-cylinder Henderson undergoing minor repairs at the Hemmings filling station gas pumps. 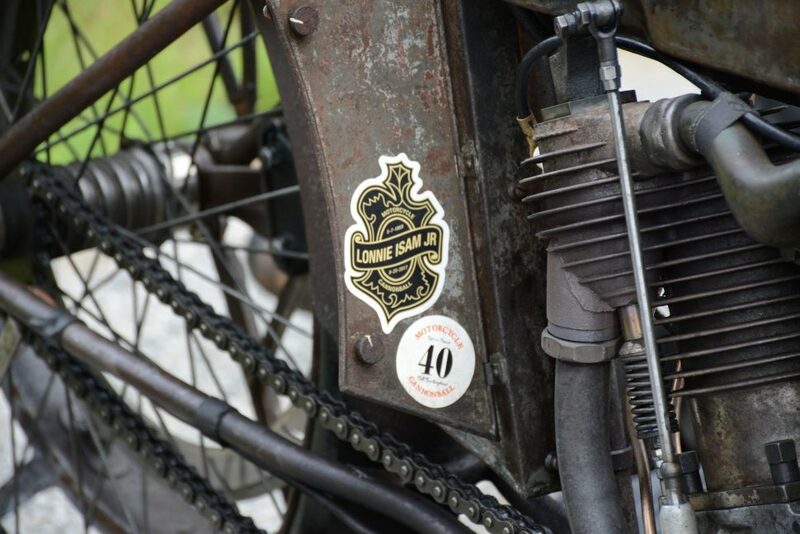 Decal attached to entered motorcycles pays tribute to Lonnie Isam Jr., who created the original Motorcycle Cannonball in 2010. Lonnie succumbed to cancer in August 2017. 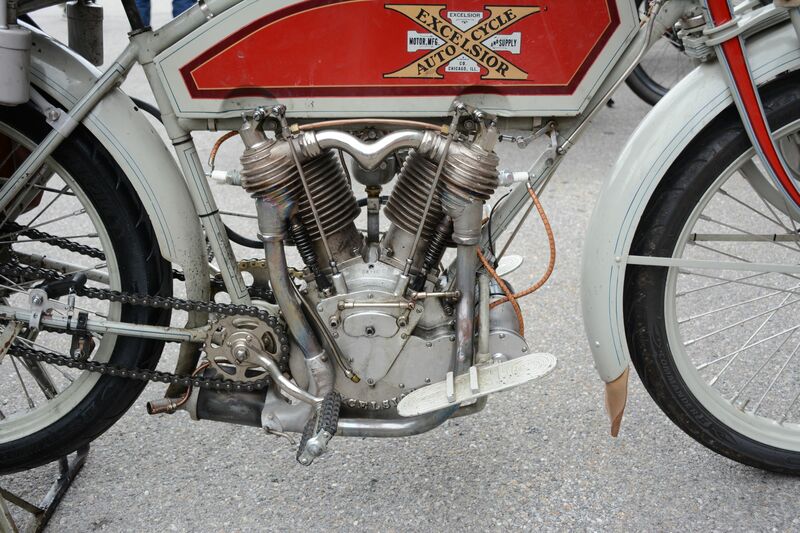 Dan Emerson’s 1911 Excelsior single-cylinder is one of two 1911 bikes (both Excelsiors) entered in the event. This is helpful, because in the event of a tie at the finish line in Portland, the older bike wins. 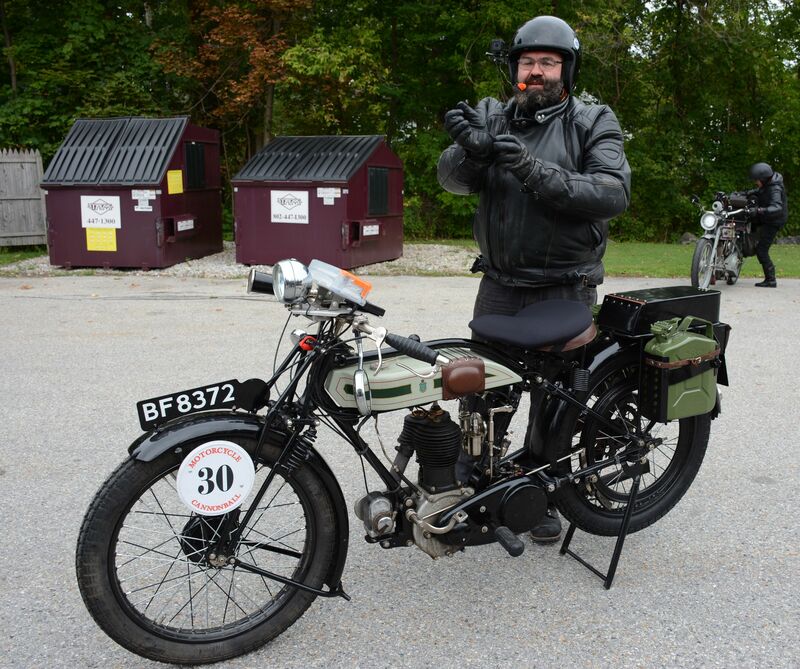 A belt-driven 1911 Excelsior ridden by Chris Tribbey purrs into the Hemmings Motor News headquarters’ parking lot on day two of the 2018 Motorcycle Cannonball.